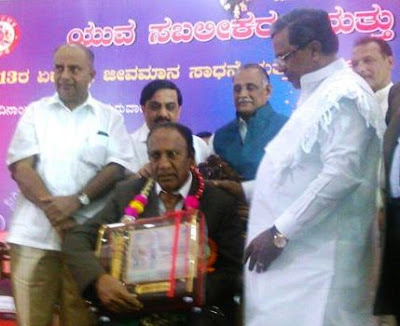 Gadhinglaj United Football Association has selected Dada Peer, a veteran coach from Bengaluru for the prestigious Football Proud award for the development of football since last four decade. In an endeavor to serve the football community, Gadhinglaj United Football Association has introduced the Football Proud Award, given away annually to the National-level players, coaches, organizations - who are working for development of football. The main object of this award to motivate individuals and organization who are working for development of football in India. As a player, Dada start his journey from Shimoga. During his playing days, he played for all top clubs in Bangalore. From 1977 to 1979 he played in Kolkata. After retiring from the game, he complected NIS and Joined Karnataka Sports Council as a football coach. In his 16 years carrier, Dada Peer produced more than 300 state players at various age-level, many of them went on to represent the country later. Also, he coached the University football team. Dada Peer has coached BDFA Super Division teams Karnataka State Police team and BEML (in 2nd division I-League qualifiers. Karnataka State Police won All India Police trophy in Kashmir 2001 under his guidance. The award ceremony will be held tomorrow 11 am at the Nagarpalika Sahu Hall, Gadhinglaj.